It’s been pretty frustrating on the book front for the last few months. We’ve given the manuscript to a number of national publishers and there has been nothing to do but wait for responses. I’ve been keeping myself busy teaching ski lessons, beginning to prepare for spring practice and the 2014 football season and umpiring high school baseball games. The plan all along has been to seek a national deal that would get Big and Bright the widest exposure. Failing that, we plan on looking for regional publishers in Texas. We had at least one near miss on the national front, but unfortunately have not gotten any offers from the big publishers. This week my agent told me its time to start looking for a regional publisher. Somewhat disappointing, but I didn’t write this book with the goal of creating a national bestseller, I wrote it because I found the subject fascinating and believed I could do it justice. My success on that score isn’t measured by whether New York publishers think it has a national audience. So it’s time for plan “B”. I’m optimistic that somebody in Texas will want to take it on. Texas was always going to be the best market for this book anyway. And I’m anxious to get back to work. It’s belated, but congratulations to Ronnie Casey, a longtime assistant at Stamford High School who has been promoted to the Head Coach position. It’s always good when a successful program can stay in-house and I’m sure Coach Casey will do well. Cedar Hill has been a remarkable story these last two years. As exciting as they’ve been on the field they are also amazing and unique in how they go about their everyday business. While working on this book I had the privilege of seeing a number of ways teams prepare, but the method Joey McGuire brought to Cedar Hill is something unique. The line between looseness and lack of discipline is thin and a scary one to walk, but the Cedar Hill program has found a way to maintain accountability while keeping the process fun. Circumstances would have it that I would spend more time with the Longhorns than with any of my other programs during the 2012 season. It was a tremendous ride and a great final chapter of my journey. …It was a frustrating early season for the Longhorns, losing three of their first four games. But 1-3 doesn’t quite tell the whole story. Too often, in both football and life, numbers are assigned deeper significance than they deserve. A 200-pound man may be fat or thin, depending on how tall he is, a $100 dollar price tag may be exorbitant or a bargain depending what it buys. In football, 1-3 can mean different things depending on the circumstances. Cedar Hill may have played the toughest first four games of any school in the country. The Longhorns opened with the eventual class 4A state champion Denton Guyer, beating the Wildcats, 54-28. For their second game, the ‘Horns came up short against, the No.2 ranked team in the nation and the eventual Class 5A-DI state champion, the Allen Eagles. In week three, Cedar Hill fell to Washington High School, from Miami, Florida. Washington would finish their season ranked 13th in the nation, and win the Florida 4A state title. Week four was the start of district play and the ‘Horns, playing in one of the toughest districts in the state, would lose 48-35 to DeSoto. DeSoto would eventually lose its only game in the state semifinals, to Allen, and finish the season ranked third in the nation. Even with this schedule, the Longhorns had their chances. Starting running back Jared Rayford, the most explosive player on the team (that’s saying something) and the player the ‘Horns had planned on centering their offense around, blew out his ACL against Allen. With him, McGuire believes his team would have come out of the early season with more wins, instead of searching for a new offensive identity. I’m told nobody directly involved with the Longhorn program panicked as a result of the tough start. In fact, McGuire later viewed the DeSoto loss as a positive. After two losses, the fact that the ‘Horns had shown so much heart and scored 35 points against DeSoto showed potential. The rough start may have been just what they needed, exposing the teams’ weaknesses and allowing them to be fixed before the games started to matter. From the outside, however, many were quick to write the Longhorns off. Cedar Hill dropped out of the polls and spent most of the season under the radar. Monday morning during athletic period, the defense is in the weight room with tackles coach Cory Jennings. 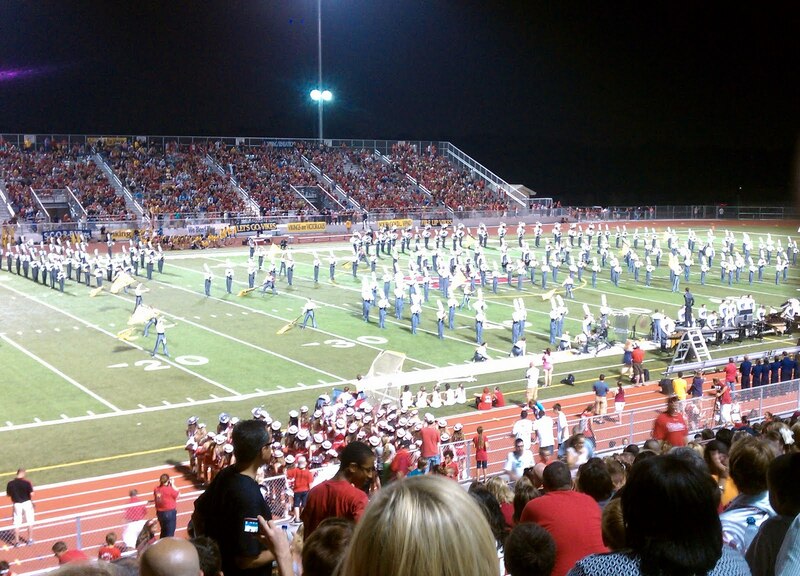 Regimentation isn’t part of the Cedar Hill program, unlike what I just left in Harlingen. The kids work hard, but at their own pace. Some wear black, others red, still others are bare-chested as they do hang cleans and side lunges. TTHL is painted on the wall, “Turn Those Horns Loose,” a common mantra within the program (Hook ‘em Horns is trademarked by UT). TTHL is especially appropriate for this team which plays so well when playing with abandon. The offense is outside, walking through adjustments. This week the offense is going back to calling plays off wristbands. Glaze and his staff guess Midlo has enough film to have broken the signals the ‘Horns have used most of the season. “Let’s go, LETS GO! !…LETS GOOOOO!! !” McGuire yells out as he gets on the artificial turf at Longhorn Stadium Monday afternoon. “We’re going to have a GREAT DAY!! !” As the music is turned up, he grabs various players in headlocks and bear hugs, looking like an excited kid on Christmas morning. The enthusiasm of a Longhorn practice is something to see. Music is always blaring, coaches are dancing as they run drills and the players are encouraged to be loose and have fun between reps. Good-natured trash talking is common and the defense celebrates when making big plays vs. the scout team. Practice often begins with McGuire playing DJ from the pressbox, joking and encouraging his players and coaches over the speakers during warm-ups. McGuire came from Crowley to Cedar Hill in 1997 as an assistant under a coach with a more disciplinary style. During those years the ‘Horns had talent but poor numbers and didn’t play with much emotion. McGuire decided to do things differently if he ever got the head job. Football can be a grind, full of routine and tedious repetition; the season is a long slog and practices aren’t always fun. Only 31 when he got the head job in 2003, McGuire was the youngest head coach in the Texas 5A. He immediately implemented his philosophy, part of which included trying to make the day-to-day fun. Besides making things fun, the philosophy creates a level of trust when McGuire reprimands his players. McGuire blow-ups are frequent and impressive enough that the coaching staff immortalizes each one with a ‘Mag’. A sheet of paper with a capital “M” is hung on the office wall with the date and a relevant phrase for each. “Who let in the twirlers (? )” and “I’ll call your mamma” are some of the more benign examples of the dozens of Mags lining the wall by the final week of the season. Seeing a few players and coaches get “Magged,” I can attest it’s something to witness. If it were possible for smoke to come out of ears, it would happen here. McGuire looks like he’s going to come out of his skin and the person the anger is directed at must just stand there and take it. For all the anger, however, McGuire hugs and loves on his players much more than he chews on them. His fury dissipates as quickly as it rises and everyone seems to know the outbursts aren’t to be taken personally. “The kids know I care about them and they know where the yelling is coming from,” McGuire says….